I'll get to the giveaway winner...eventually! :) And the housecleaning isn't really ending (probably gave my hubby a good scare with that title! ), I just won't be posting about it! MY progress on Friday's project: Well, I had to postpone the recipe organizing project until Saturday since my son's birthday was Friday. Couldn't fit it in with all the baking & fun! So I worked on it for a few hours on Saturday. I got all my loose recipes (that we regularly use) put into page protectors and categorized. I wanted to fit them in 1 binder, but ended up with 3! I decided they were A for All the recipes we usually use, B for Beverages, breads & breakfasts, and C for Chocolate (oh yeah!!)! And I did do your assignments from Friday! Overall, Housecleaning Week made my man happy too! I learned a couple of things during the week. 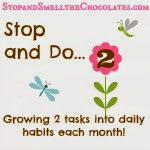 The small assignments were easy to do - I just might make a long list of easy tasks and always give myself 1 or 2 a day. The big tasks were too much to do in a day when I made myself do regular cleaning, etc. first. BUT - baby steps are OK (a flylady concept)! I am really happy with the progress I made on all those projects and since every day was something new - I didn't have anything to dread! I am going to assign myself all the same projects this week and I should be able to complete most of them. After that, I'll come up with a couple projects at a time to work on. Did you join in the cleaning? Was it helpful? Some of you are already organized and you inspire me! Congrats Kathy - I'm glad you didn't let Kim win this time - LOL!! Thank you to all of you for putting up with all those posts about your least favorite subject - cleaning!! I appreciate it - it helped me a lot! Have a blessed Monday my friends! Well my friend a clean house is well, a clean house. LOL. Big it's like I won because she's my best friend and we share stuff size hugs to you. 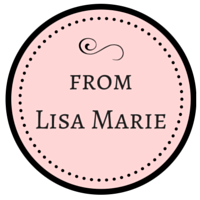 Thank you so much Lisa - you are toooo sweet! Congratulations Kathy. I wish I was feeling better last week. I did try to accomplish some tasks. I started the purse project and felt ill. I don't think it was from the cleaning part it was just my turn for the bug that was going around my house. I am starting a new week and by God's grace will get through and TRY to accomplish some of your last weeks chores. I may even get some of my minions to pitch in so I can do some of your projects. Nice challenge? Oh, I still need to fix the hole in the wall. Possibly this afternoon when boys are at soccer and I can send little ones outside. 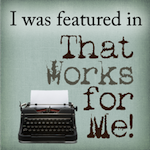 Thanks for blogging and giving me a break from the monotony around here. 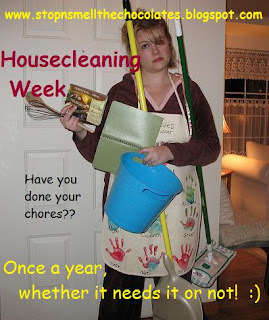 I'm glad that cleaning week was a success for you! Sadly, I did not clean along. I know, my house needs an intervention right now!